Paparazzi! 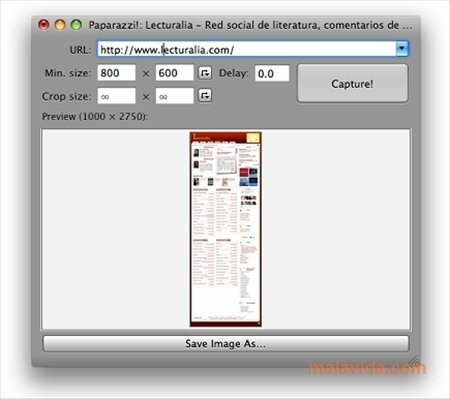 is a utility that will allow you to capture any webpage as an image. 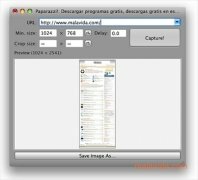 Simply indicating the URL, this application will load the web with the Safari engine (without opening the browser, of course) to capture all in a single snapshot. One of the advantages of Paparazzi! is that it allows you to configure the resolution with which you want to capture the web. Thus, even though you only have a 1024x768 screen, you will be able to take the captures in the size that you want. That can come in very handy to see how a design ends in the resolution of a gadget, for example. The program's interface is very simple and almost doesn't use any of the systems resources. On it you will find very few configuration options and a preview area in which you will be able to view the result of the capture as a thumbnail. The truth is that if you download Paparazzi! for free it will offer you the possibility to capture images of a web page that you will later be able to change however you like. 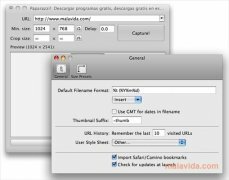 Of course, it is also possible to edit the default name that is assigned to the images and to import your favorite from Safari and Camino, among other options. And all this in the most simple fashion.